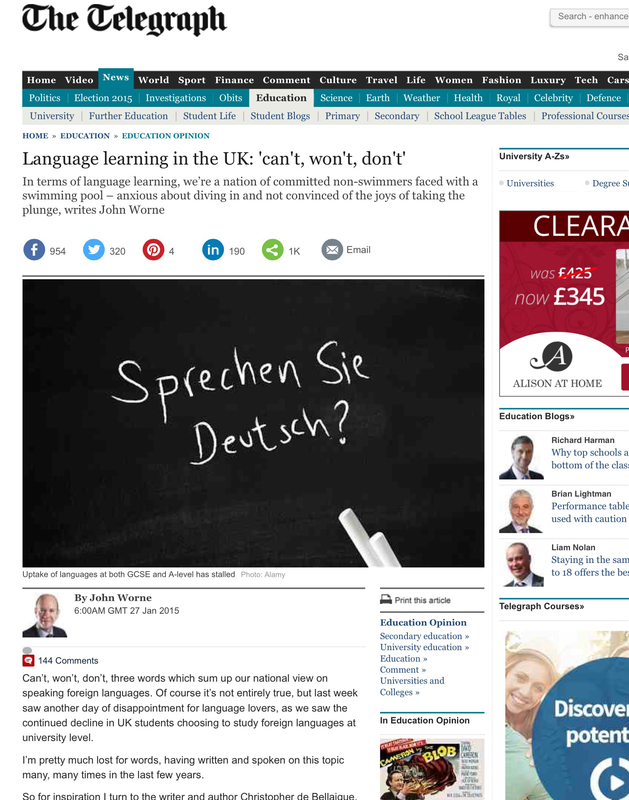 Can’t, won’t, don’t, three words which sum up our national view on speaking foreign languages. Of course it’s not entirely true, but last week saw another day of disappointment for language lovers, as we saw the continued decline in UK students choosing to study foreign languages at university level. I’m pretty much lost for words, having written and spoken on this topic many, many times in the last few years. “It’s as well to remind ourselves that our ancestors thought nothing of picking up languages: one for the village, the other for the town, and perhaps another one entirely for the capital city, and that nowadays supposedly less educated people in other countries can end up knowing half a dozen. He’s not wrong. For the past seven years, the number of UK students choosing to study foreign languages at university level has been in steady decline – and sadly, this latest news does very little to suggest any prospect of us re-commissioning our collective brains. While there is some progress – languages are now on the menu in more primary schools – there’s a long haul ahead. The latest national school exam results show that uptake of languages at both GCSE and A-level has also stalled. More than 10,000 fewer language A-level exams were taken last year than at the end of the 1990s, with GCSE entry figures again showing a drop in the number of Modern Foreign Language exams, following a couple of years of growth. Perfectly intelligent people will tell you not to worry. Everyone speaks English in the world of business (they don’t), your iPhone will now translate road signs for you (but you may crash or choke on the roaming data charges) and the next generation of wearable tech will enable intercultural telepathy anyway. Cobblers. Language learning is vital for the UK’s future prosperity and global standing. Languages are essential for our trade, prosperity, cultural exports, diplomacy and national security. The most recent CBI/Pearson Education and Skills Survey showed almost two-thirds of UK businesses need foreign language skills – and expect that to grow as more firms look to break into new fast-growing markets, with the UK’s concerted export drive. The problem is many UK businesses have given up on home-grown talent and rely on translators or hire abroad. The only really piece of good news is forward-thinking universities are offering students the chance to study a language alongside another degree subject. A number of students are opting to do so – more should. It’s a particularly attractive combination for employers. The tough reality in a tough jobs market is a lawyer with Chinese language skills is more in demand than a pure lawyer or a pure linguist. There is no doubt the UK needs more of our young people, not fewer, to develop their language skills to at least a functional level for trade and export. But more than that, understanding another language is the basis for understanding another culture – and an open mind and an international outlook have never been more important for the UK’s place in the world. What to do? I’ve said before when it comes to language learning, we’re like a nation of committed non-swimmers faced with a swimming pool – anxious about diving in and not convinced of the joys of taking the plunge. So, parents of the UK (and I’m one), what it is going to take is a cultural shift in homes up and down the land. Unless we as parents start thinking more about languages, and international experiences, as essential strings to our children’s bows, it’s not going to happen; the school and education system can’t fix it without us. I leave you with the thoughts of the Principal of the British School in Tokyo who kindly picked up on our Languages for the Future report.